This is 12 helpful tips on how to make your own wood sign. 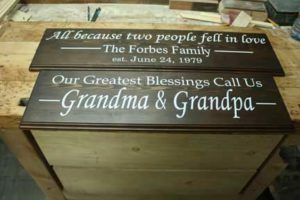 There are a lot of ways to make wooden signs, and these tips will help you make signs that you can be proud of, and that your customers will love. Enjoy. Wooden signs are a very popular gift, and you can find them nearly everywhere in stores and online. 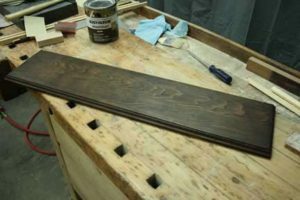 Thankfully, as a woodworker making wooden signs is a very easy process that you can start right away. You don’t need a lot of tools to make wooden signs. In fact, it takes very few tools to make the base boards that you use for your signs. After that, you just add the letters for the different sayings or expressions. 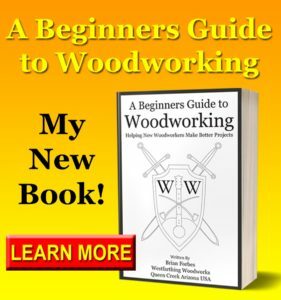 This is great news for you is a woodworker, because you can start making wooden signs very quickly, especially after reading the rest of these tips. All you really need to know are a few things in order to be successful, and then you can start cranking out signs by the truck full. Here are the tips, and I will go into each one of them in more detail so you can get the most from it. They are all super helpful. 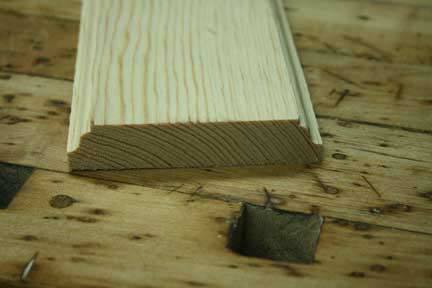 If you want to keep the cost down, one of the best species of wood that you can use is Pine. The nice thing about Pine is that you can get it from several different places, including your local home store. Most wood signs are made from either a single board, or several boards put together to look like a pallet. Depending on what look you’re going for, Pine will offer you many choices as well as a low price no matter which way you go. 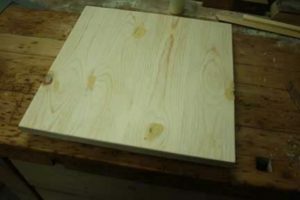 As with most pieces of wood, the larger solid boards are going to cost more. If you are going for the pallet look, you can save some money by buying narrower boards and gluing several together. Again, it just depends on your look. If you don’t have any wood right now, head over to your local home improvement store and take a look at their selection of Pine boards. Most of the signs are rustic anyway, so the little knots and imperfections will only add to the overall look. Another great place to get wood for wooden signs is from pallets. Depending on the condition of the palettes that you find, in can range from newer looking wood to extremely aged and weathered wood. The other nice thing about pallets is that the majority of the time they are free. This is huge if you are selling your wooden signs, because now your cost per piece is very low. This means more profit per sale for you. Make sure that you’re not stealing palettes for this purpose. There are a lot of places that will just give them to you if you ask. It does take a little time to separate all the pieces, but the effort can be well worth it for free materials. Finally, going back to the rustic look of most wood signs, pallet wood needs almost no additional treatment in order to look very rustic. This saves you time, product, and of course money. That’s a triple win for you. 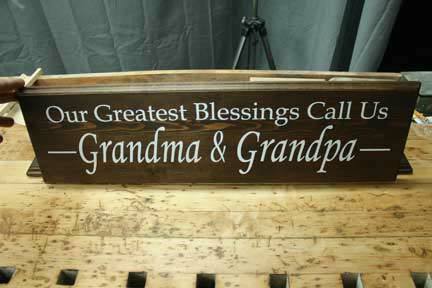 The most successful wood signs have very eye-catching proportions. Take a look and you will see that most signs tend to have good ratios between their height in their width. Use this to your advantage when you decide on the sizes and shapes. One of the best ratios is 2 to 1. This means if your sign is 30 inches wide, then make it 15 inches tall. You can apply this to many different signs and get a very proportional and eye pleasing look without a whole lot of math. For some longer sayings, a 3 to 1 ratio is also good. This can end up making a very tall vertical sign, or a wide horizontal side. Consider what type of message the sign will carry, and that can help you with proportion as well. No matter what your proportions are, The easiest way to put together your signs is with nails and glue. Obviously this is for signs are made from more than one piece, but the process is very fast, and produces a strong sign. The best way to nail the pieces together is with a pneumatic nail gun. Brad nails are just fine for this purpose, and they hold all the pieces together while the glue dries. Apply a layer of glue between all pieces, and then fire a few nails in from the back. Make sure that your sign is square, and allow the glue plenty of time to cure. Once the glue has cured, your sign will be very strong, and you can go ahead and start finishing or adding your lettering to complete the look. Another thing you can do to make better wood signs is to match the look of the board to the expression written on the sign. If you have more country rustic expressions, then opt for a country or rustic looking sign. In contrast, if you were going for a more modern saying, and perhaps an expression about business or entrepreneurship, then go for a more modern approach when it comes to building your wooden sign. This can be as simple as choosing the right color, or the right staying. You don’t have to drastically change your design, you can just change the way that it goes together, or the color that you choose for the final look. When you make a wooden sign it needs to have a cohesive message that matches the entire look of the peace. It would be odd to see a very rustic sign that talks about hustle and grind. Match the look of the sign to the expression, and you’ll get an easy win. For most would signs, a routed order around the outside is a nice touch. It doesn’t take very much time at all to accomplish, and it looks a lot better than the normal squared edges that are on your piece of wood. The most common bit for creating this type of order is called in Ogee. Most router bit kits come with this bit, and it has a graceful profile that is very eye pleasing. 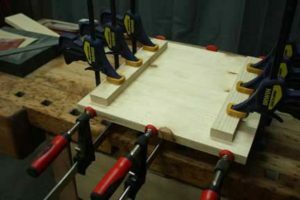 Using a router table, or hand router, and it’s easy to apply the pattern around the peace. Be careful when you’re working on the end grain though, because it can chip out. 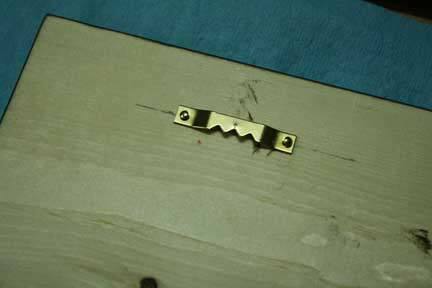 It can also catch and pull the piece away from you, which can pull your hands close to the router bit. Take precaution, and make sure that you are working as safely as possible at all times. A little distressing on your signs is a good look. Most wooden signs have a rustic country look to them, and a little distressing on the stain or on the paint that you use can give it a nice warm aged look. 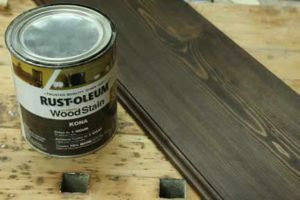 Distressing your paint or stain is as easy as applying the color, and then going back later with sandpaper to remove it in certain areas. Try to make this look as natural as possible by going for edges and corners when you remove the color. These are the areas that would typically wear the most as a old piece of woodworking is handled by many people over the years. You can duplicate that same look by carefully picking the edges and corners to distress. There are a lot of ways to apply letters to your signs, but the absolute best it’s called the silhouette cameo. This machine uses a small blade to cut out lettering for you, and it comes with software to design your look. All you do is build the lettering on the computer, and then export it to the machine to be cut out of adhesive backed vinyl. Once that’s done, you pull away the excess, and transfer the lettering directly to the sign. If you use contact paper first, you can pick up all the letters at once and then transfer them to the sign in one shot. This is far easier than trying to transfer them one at a time, and it perfectly preserves the alignment that you created in the computer. 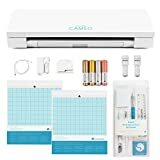 For the amount of time that this machine will save you, especially in a production situation where you’re trying to build and sell these signs, the Silhouette Cameo will pay for itself very quickly. Once you have it, you’ll wonder how you ever made wooden signs without it. Until you have the ability to buy a machine that cuts out the lettering for you, you can always buy pre-cut letters that are adhesive backed. You’re going to have to do some math and figure out how many letters of each you need, but you can do it. Arrange your letters carefully so that way there are no spelling mistakes, and then start transferring them to your wooden sign. Again this is not ideal, or the way that most people do it, but in the situation where you’re only making one or two signs, it’s not that miserable. If you have to make signs for 50 people however, you might have to start in January to be finished by Christmas. It’s 1000 times easier to use the silhouette to cut the vinyl for you and then just apply at using contact paper in one motion. After the letters have been applied, you need to trap them to the surface. 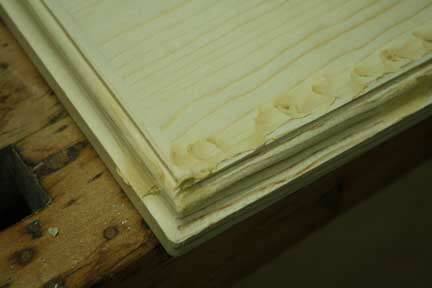 This is a step that is important, because over time the vinyl can come off of the wood. The nice thing is that this is an easy part of the process. If you have some mod podge laying around, you can simply coat the entire front of the sign with a nice layer. This will trap the vinyl really well, and also create a bit of a protective coating for your son. You can get Mod Podge Here on Amazon. Mod podge goes on kind of white looking, but then turns clear over time. Once it dries, the evenness in the sheen will also make the product look a lot nicer. You can choose your sheen with mod podge, so make sure to pick the one you like when you buy it. Apply a layer of mod podge carefully, and don’t hose the surface. 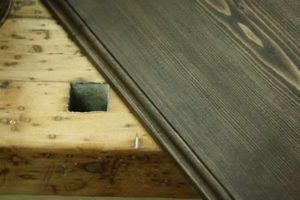 You don’t want any getting under the vinyl and lifting it off the wood before it has a chance to seal it to the surface really well. Go carefully with your brush, and resist the urge to rush. Another way to seal your vinyl is using clear lacquer. Make sure to use good quality lacquer and not just clear coat from the bottom shelf of the spray paint section. There is a very big difference, and you can find out the wrong way by using the cheap stuff. For the first coat, dust the surface with lacquer and give it a chance to dry. Apply one or two more coats just like that in order to start trapping the vinyl. Then, you can come back with one good coat that is a little heavier. Allow the lacquer to cure, and then you’re able to handle it freely. The lacquer will even out the sheen, and hold the vinyl to the service. Both of these qualities are good for your wooden sign, and will help it last longer in a customers home. Finally, the easiest way to hang your wooden signs is with sawtooth hangers. You can find these nearly anywhere that sign accessories are sold, and even home stores have them for repairing picture frames. Pick up a set of these, and if you like them you may want to order a bulk package online. They will be less expensive, and you will always be able to use them. They never go bad, and they make it very easy for customers to hang their signs. Each one of these hangers installs with two little nails, and I recommend putting two of them on every one of your wooden signs. It’s easier with two of them, because you never have to worry about getting one of them right in the middle or the sign tipping off level. 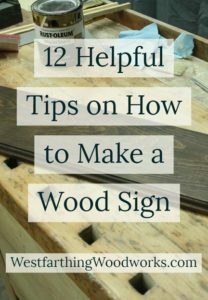 Now that you have all these great tips on how to make wood signs, you should really give it a try yourself. The process is easy, it’s a lot of fun, and you no longer have to choose something off the shelf at the store. If you want to very specific sign for yourself, or very specific sign for somebody that you like, you can now make that in your shop. It will also be a lot less expensive. Signs are so popular the price is higher than it should be. 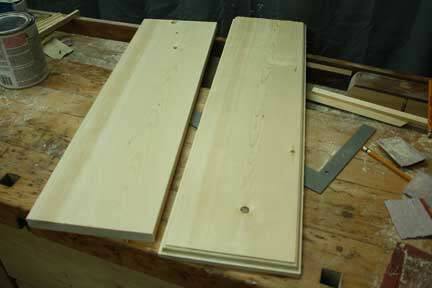 Pick up some of your scraps, and glue together some flat boards in a 2 to 1 proportion. Think about what you would like to put on them for expressions, and look online for inspiration. You’re sure to find several that make you smile. Happy building.